About a week ago HEXUS covered the leak of early benchmark results from an unspecified AMD Ryzen 7 2000 series processor. We got to eye what could be the first benchmarks of a Ryzen 7 2700X with 8C/16T, base 3.70 GHz / boost 4.35GHz and a TDP of 105W. The Korean source shared popular synthetic benchmarks from suites such as AIDA64, 3DMark, and SiSoft Sandra. 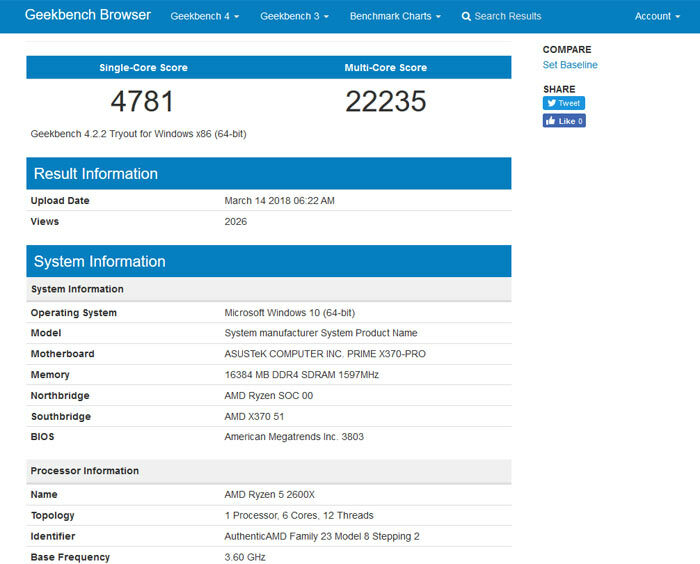 Today, some Geekbench processor benchmark scores have come to light for what is claimed to be an AMD Ryzen 7 2700X processor. The headline figures of a single core score of 4746 and a multi-core score of 24772 compare very nicely to the first generation equivalent (Ryzen 1700X). I found typical recent user scores with the Ryzen 7 1700X processors running a similar memory configuration were on average approx 4300 (single-core), and 21500 (multi-core) respectively. However, the official baseline scores for a Ryzen 7 1700X are 4062 (single-core), and 21023 (multi-core). Giving some more perspective, in the official Geekbench processor benchmarks charts the top performing single core processor is the Intel Core i7-8700K with a score of 5930, and the Intel Core i9-7900X is the top multi-core performer with 33261. 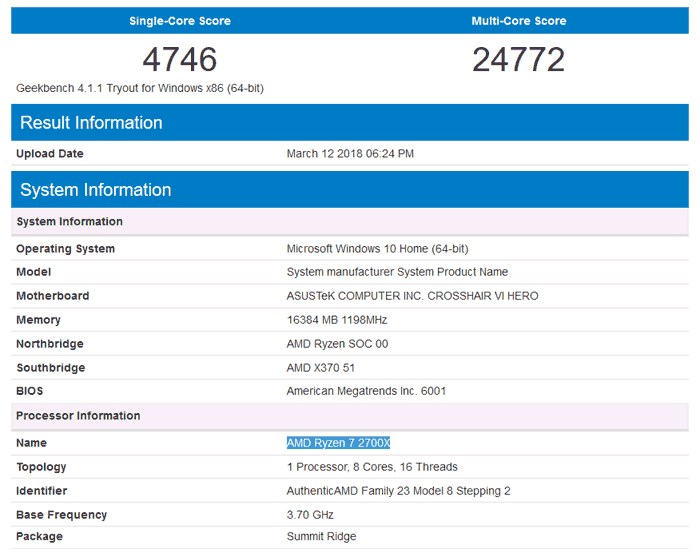 Looking more closely at the new Geekbench scores for the purported AMD Ryzen 7 2700X, we can see that the user employed an Asus ROG Crosshair VI Hero motherboard, the processor ran at its default base frequency of 3.7GHz, and the accompanying 16GB memory ran at 2.4GHz. Taken on their own, the Geekbench scores provide an indication of appreciable but not revolutionary intergenerational performance increases. One thing to remember is that the Asus ROG Crosshair VI Hero motherboard uses the AMD X370 chipset, which while compatible, isn't expected to offer the support for Precision Boost Overdrive that will be a feature of 400 series boards. The first Ryzen 7 2000 desktop processors are expected to launch in April. So Im guessing this does not have a hardware defence against Meltdown and Spectre. AMD is less affected but AFAIK it will be Ryzen 2 and the CFL successor next year which should have them,unless both companies says something different this year. IIRC AMD was never affected by Meltdown (and by default, it is hardware immune) but Spectre it will still be affected by. That said, you'd assume that all 400 series boards will come with a BIOS that has Spectre in mind, and get updated with OS..es that have relevant fixes. Pinnacle Ridge is supposed to be immune from Spectre attacks at a firmware level - per AMD. AMD is fundamentally immune from Meltdown and Spectre V2 has never been successfully implemented on AMD hardware. In essence, AMD is only vulnerable to Spectre V1. Are these results with, or without the Meltdown/Spectre fixes?